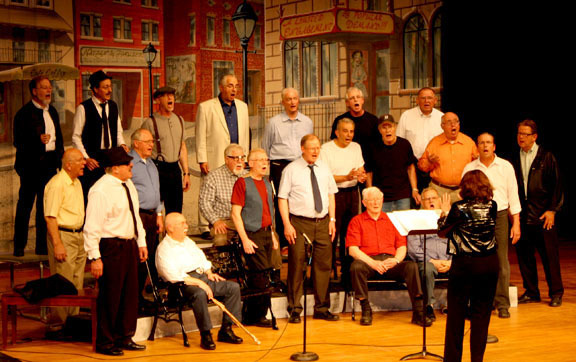 The Men of Orpheus male chorus of Lansing, Michigan dates back to 1926 when it was founded by the REO automobile company as its in-house men’s glee club. Now independent of corporate affiliation, the group became a member of the Great Lakes Male Chorus Association at its founding. Prior to that, it was active with the Michigan Male Chorus Association for several decades. In serving its mission of advancing cultural awareness in the Mid-Michigan area, the chorus helps to strengthen community spirit and elevate appreciation of the arts by providing fine music at diverse venues, both public and private. During a typical year, the Men of Orpheus performs several concerts by request and a minimum of two formal concerts in the Mid-Michigan area open to the public. At the invitation of diverse groups in its community, the chorus performs for seniors, as well as churches, service organizations, and collegiate and professional sporting events. The Men of Orpheus maintains a membership policy open to male singers at least 17 years of age. No auditions or musical experience are required.